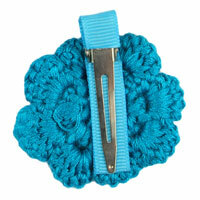 Turquoise Crochet Clip Flower. This crochet flower is made beautifully and features hair clip on the back. These flowers measures approximately 1 5/8" to 2 1/4" in diameter – making them a perfect choice for headbands. They are currently available in 9 adorable colors!